Make Superior Pneumatic's Safety Rescue Kit part of your life saving equipment. Our Air Hammer cuts through metal doors, braces, window mechanisms, posts and roofs quickly without sparks when time is of the essence. Hammers are produced from aircraft quality tool steel and aluminum. These are the same hammers used by Sears, Goodyear, Firestone and Western Auto service centers world-wide..
2. 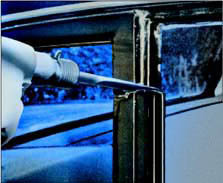 Secure, safe chisel holding to meet OSHA requirements. Same great safety kit, but designed to work with a 4500 PSI Tank. 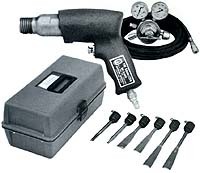 Increase the hammer's cutting time with a 4500 PSI tank! 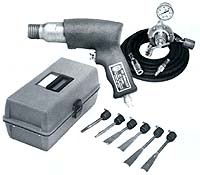 For faster and extra heavy duty cutting, our kits for the 2000 PSI and 4500 PSI air tanks include the Model 80010 Heavy Duty Industrial Air Hammer. This hammer has a four (4) inch piston stroke for extra power and a lever-type trigger for easy control. Contains same hammer and accessories as the No. 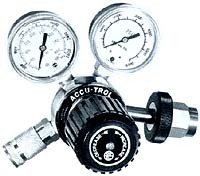 550 kit above...but has the high pressure regulator #4911945 with #347 CGA tank fitting that lets you use the kit on the 4500 PSI Scott¨ and Survivair¨ air tanks.